How to Lead an Effective Pre-event Meeting! “Excuse me, what time is dinner served?" These and many more questions like them are consistently asked at events. How do we handle them? With a pre-event meeting! 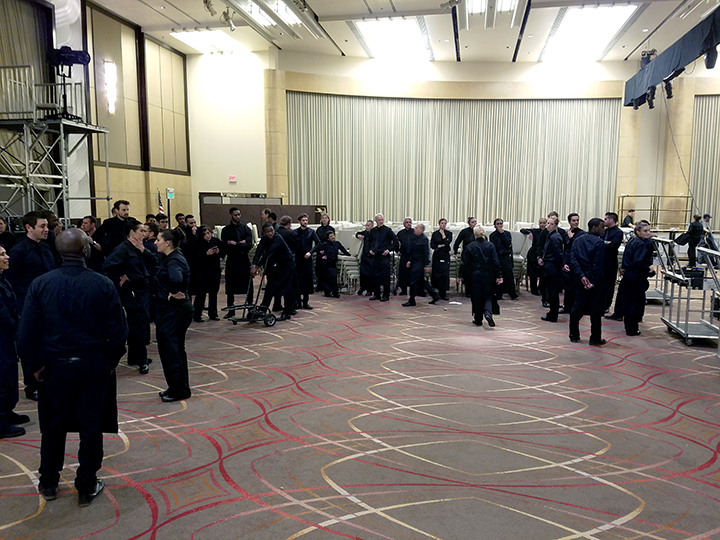 The pre-event, aka pre-shift meeting is an important activity at every event. Gets everyone on the same page, moving in the same direction, at the right time. If you don’t have this, managing an event staff becomes a massive exercise in cat herding. The pre-meeting is not the time to discipline staff for previous grievous acts, read the company newsletter, or provide political discourse. What points need to be covered? At the end of this article is a master pre-event checklist I have developed over years. This checklist is a living document, meaning you add or adjust over time as a result of experiences both good and challenging. This also means you don’t have to cover all of the points in this checklist at every event—only what is needed. For example, staff people that often work together at a familiar venue may only need a short five-minute refresher. For larger and more complex events, usually with new or fill in staff, the meeting can often run up to 20 minutes, and needs to be led by the staff responsible for executing the event. The event manager, captain, lead, sales reps, and owners need to stand in the background; otherwise staff may become confused. The pre-event meeting needs to be efficient and effective. Plan in advance, not three minutes before you gather staff together. Sit down before heading to the venue, review the checklist list, and determine what needs to be covered. Skip the nonessentials. Give it a second look over and perhaps add a point or two based on some aspect unique to this specific event. Often the last minute point shows up as the event is coming to together. Getting ready for the pre event meeting at the Emmys 800+ FOH staff. Announce: Provide advance notice of when and where the pre-event meeting will commence so everyone keeps an eye on the clock and attends. Otherwise, delayed tasks like pressing a shirt or completing a display may cause tardiness. Form a circle: Staff can all see each other and start interacting. The circle is more intimate than the traditional shoulder-to-shoulder line up. Welcome. Thank the staff for showing up. It’s often noted that 50% of success is showing up. Let staff know you appreciate their hard work. Meeting purpose: Is the event a wedding, a product launch, an IPO, an anniversary? What is the objective or reason for the event? Explain this to the staff and give them some background so they understand and avoid wearing their “NETMA (Nobody Ever Tells Me Anything)” badges. Introductions: At smaller, more intimate events, have staff introduce themselves. On large events this takes this too long. Encourage staff to introduce themselves to each other later as they start working together. Do, however, introduce the chef, planner, your client, the salesperson, creative partners and the like, so staff knows who they are. Often times they want to make quick comment about the event to the staff. Now is the time. These people do not need to stay for the entire meeting. Mention to staff to leave all their personal issues and problems at the door. We are here to throw a great event. It’s important to smile. Sometimes I tell a short story or cite an inspirational quote from a famous athlete, artist, or newsworthy person. A staff member once said my pre-event meetings were a little like going to church—in a good way. In the end, we are the people development business. Food and hospitality are just the mediums. This is the place where recognition of previous outstanding performance is offered. This praising point encourages good and desirable behavior from others. Everyone likes to hear praise, especially when it involves themselves. If you have not already inspected the staff, now is the time make the final touches for consistency. Hair: Pulled back and up in bun? Lint roller: Pass to remove lint and stray hairs. Ties: Straight and knots neat. Shoe brush: Pass around for a quick polish. Protection: If we’re outside and the sun is beaming down, offer sunscreen. Sometime we bug spray each other if flying insects are present. Aprons: Strings tied under the apron in front. Accessories: Are staff being provided special logo-branding associated pins, tie clasps, pins, name tags? Often on branded or sponsored events staff is given special shoes, clothes, sunglasses, hats, aprons, etc. from the client to wear. Adjust as needed. Pass out the event one-sheet. The one-sheet is the condensed version of the specific event BEO (Banquet Event Order). It includes details like the menu, timing, layout map, specific assigned responsibilities for staff, their supervisor, as well as social media hashtags and WiFi access details. The one sheet covers who, what, why, when, where, and how of the event that is about to begin and needs to be prepared long before arriving on site. Assignments: Review and confirm assignments and make any needed adjustments. Reminder: No assignment is demeaning. All are important to help the team succeed. Review the important time points: guest arrival, start and end of tray passing, conclusion, breaks, and when to be on and off the floor during presentations and speeches. Respect: Sometimes prayers are said, the national anthem is sung, or a Pledge of Allegiance is said. Remind staff to stop working and show respect during these moments. Volunteers: I ask who needs to or wants to go home early if the scheduling permits and also ask who can stay later if the event is extended. No reason to keep unneeded staff and better to have willing volunteers to stay later if needed. Depending on the event schedule and state-local labor laws, staff needs to have a break to refresh, rest, or eat. Tell the staff when the expected break time is scheduled and where to grab a snack or their meal. Remind them to stay hydrated with water, not soda. Point out where drinking water and hand-washing stations are located. 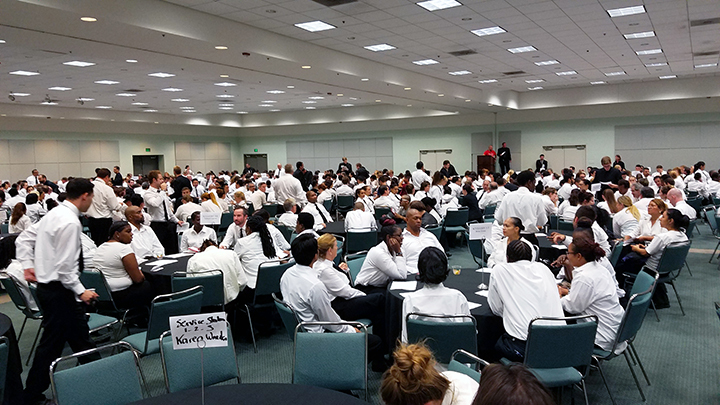 19 plus plating lines, 800+ FOH staff make for a smooth delivery of 4,132 plated meals during The Emmys. 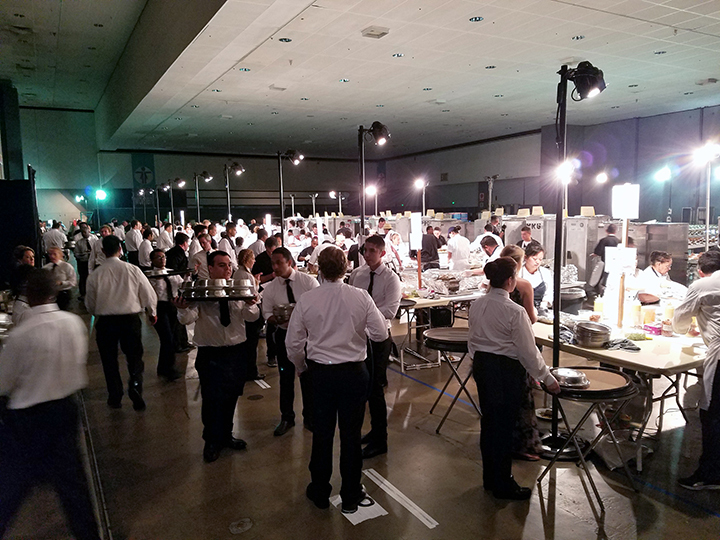 Depending on the complexity of the menu, event leaders ought to be able to explain the menu, special techniques, and demonstrations terms. Sometimes the chef is present to explain or answer questions—but often not. To that end, review the terms, techniques, pronunciations, ingredients, and even sourcing in some cases (i.e., Central California coast artichokes, Napa Valley oak aged chardonnay). Special meals consideration: What if any, are available (i.e., Kosher, Vegan, Vegetarian, child’s plate). Cover what is being served and how to get special meals from the kitchen. Quickly review potential allergens including gluten, nuts, soy, dairy, etc. If we’re serving new menu items and the event is intimate, this is where I might (and the chef willing), serve a sample for the staff to taste. If special, signature, or welcome beverages are to be served, explain them. Sometimes there’s a walk through on events. Otherwise, point out crucial locations or include a map as part of the one sheet. Restrooms: For guests – including special designation and handicap accessible locations. Restrooms: For staff – include a reminder to remove aprons when entering. Bar(s). It’s not always obvious. Often there are several or special bars: wine, beer, craft, non-alcoholic drinks. Valet, parking lot, and service pick up locations: Guests get turned around or want to meet someone in some specific area within the venue or want to leave and need to know how to get to their next location plus the hours of operation. Hopefully the valet stays open until after all the guests have left. If valet leaves before all the guests have departed, know where the leftover keys are kept. Some venues also have special locations designated for taxi, Uber, and Lyft services. Know where these transport methods prefer to pick up. Coat check: Point out, as not always in plain view. Lost and found. Suggestion: use coat check to hold the lost and misplaced cell phones, bags, hats, umbrellas, etc. First aid. Where is the first aid kit located? Large events always have paramedics on site to handle injuries. Remind staff that if anyone suffers an injury (including themselves), to inform the event manager. Smoking area. States like California have very specific rules about approved smoking zones. Staff needs to direct guests to the smoking designated space. Cell phone charging stations: At large events, charging stations usually abound and are sponsored. Even on smaller private events, a charging station has become the norm. Know the location. Handicap access: Identify location of ramps and special doors. Every event is an audition for another event. Roy’s Rule #7: Guests and vendors are always watching and asking, “Is this the caterer I want to do my daughter’s wedding or my company holiday party?” Often guests will ask, “Who is the caterer?” This is a cue that the event is going well and staff ought to offer a business card and suggest the guest call the office. Pass two business cards to each staff with the name of the sales rep who sold the event. Never say “No” to a guest. No matter how bizarre the request may seem, tell the guest, “Let me see what I can do for you.” Chefs and bartenders have managed to MacGyver a few requests to the guests’ surprise, who then posted praise on social media. Speak English: Unless the guest initiates conversation in a non-English language, keep the conversation in English. Even with all the multiculturalism of Los Angeles and New York, many guests are uncomfortable with conversation they don’t understand. Yeah, staff was requesting more water on table 4. The guest thought you were criticizing their clothes. I’ve had too many of those calls. I often provide a cheat sheet of basic foreign language interaction phrases such as “Excuse me, please try this food” or the foreign term for restroom, so when staff hear these phrases they can direct guests. Turn on your radar: Anticipate the guest’s needs, whether more beverages are soon to be needed or a dropped fork needs replacement. Take pictures: If the guests appear to be having a good time, offer to use their cell phones to snap a few photos. Social media event specific: If you know of any unique event-specific social media locations, i.e., Facebook, Twitter, hashtags, URLs, place the details onto the one sheet. WiFi details: If the guests have access, your staff needs details. Put this information onto the one sheet. Centerpieces and table decorations: Often the guests ask for or just take the centerpieces. Often the guests ask for or just take the centerpieces. Instruct the staff with regards to disposition of centerpieces: tackle, call security, or turn a blind eye. Sometimes the more elaborate centerpieces are rented and need to be returned. Often centerpieces are purchased with the intent for guests to take home. Staff without direction often stand around burning time until told what to do. Corners and blind spots. Remind staff to call “corner!” when carrying trays or hot pans as they approach. Potential hazards: Point out low level lighting, surface transitions, and trip areas such as tapped down cables, water puddles, and stairs. Weather issues: Make any necessary comments regarding rain, snow, or wind (hurricanes and tornados) that could or is affecting the event. Outside forces: Threat of forest fire, protestors, demonstrators. Discuss and provide direction as needed. Debris: Reminder: Pick up trash, clean up spills quickly. EAP (Emergency Action Plan): Just the highlights. You can read more about this online at catersource.com in my articles on “Dealing with an Active Shooter” or “Bomb Threat” at an event. Evacuation & exit points: Alert staff to the location of evacuation and exit points. Meet up points: In the highly unlikely instance that an event needs evacuation, point out to staff the two meet-up locations: A (onsite) and B (offsite). Special and or last minute adjustments or points to be made: Such as clearing glassware at the end. Questions: Answer any event-related questions. Remember the six points: Smile, serve, clear, move, communicate, have fun! 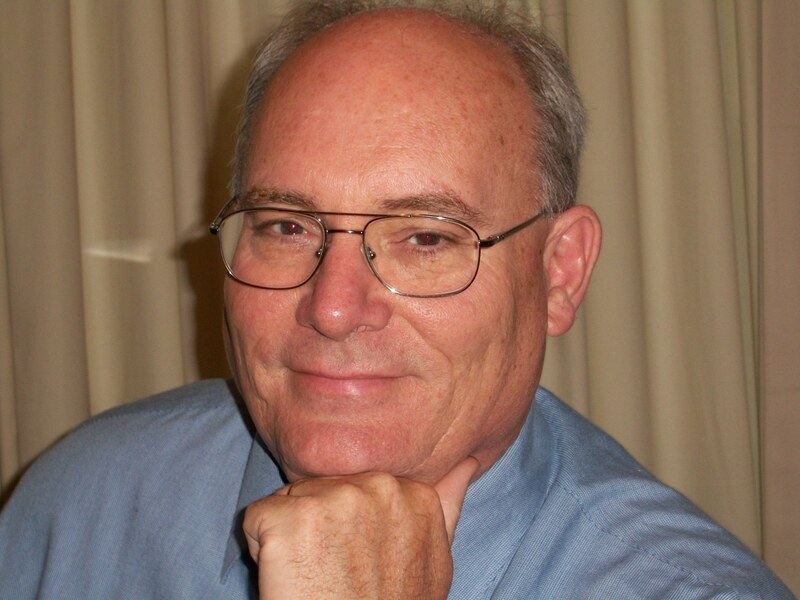 Roy Porter is the Activities Director for EngageWorks. A California native, who prior to returning to catering, spent several years in direct marketing as a planner, strategist and copywriter on numerous lead generation, sales conversion and customer retention campaigns. Recognized as consummate and approachable hands on innovator in performance improvement and training off-premise catering staffs for plating (FOH), table and bar service.